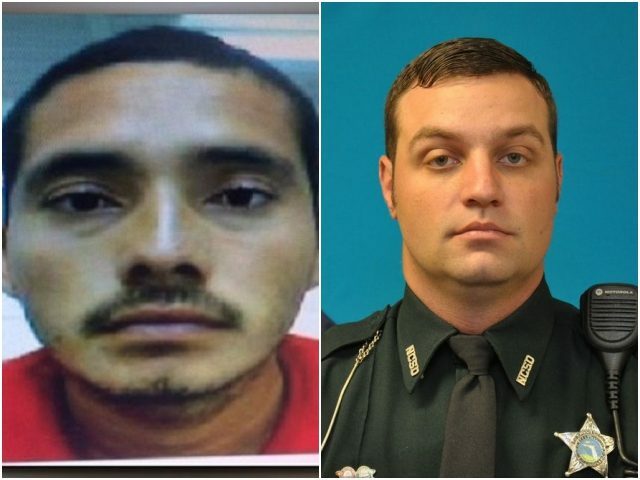 A twice-deported illegal alien has been charged with manslaughter in the death of a Nassau County, Florida sheriff’s deputy who was killed while trying to apprehend the El Salvadorian national. Francisco Obbidio Portillo-Fuentes, a 26-year-old illegal alien, was arrested and sentenced to two years after being chased by U.S. Border Patrol agents in November 2016. Now, before his two-year sentence is up, Portillo-Fuentes has been charged with manslaughter in the brutal death of Nassau County Sheriff’s Deputy Eric Oliver, News4JAX reports. Oliver’s family has continued mourning the loss of their loved one. Douglas Oliver, the killed deputy’s father, told News4JAX that the illegal alien had “ruined” their lives. Nassau County Sheriff Bill Leeper blamed the U.S. porous immigration system that allowed Portillo-Fuentes back into the country twice illegally. “If this person had not been in this country illegally, Eric would still be alive today,” Leeper told News4JAX. In 2016, Portillo-Fuentes ran from a Border Patrol truck upon being approached, making his way through the Florida 200, which had rush-hour traffic at the time, as Breitbart News previously reported. One of the deputies trying to apprehend Portillo-Fuentes was Deputy Eric Oliver, who ran across the Florida 200, but was killed by oncoming traffic. The illegal alien now faces significant jail time if convicted of manslaughter in connection with Oliver’s death.